As the Los Angeles Rams eye a spot in the playoffs and perhaps a run at the Super Bowl, they have lost one of their most important players. The Rams announced late Wednesday night that place kicker Greg Zuerlein has been placed on injured reserve because of a herniated disc in his back. His season is officially over, dealing a huge blow to the Rams as they attempt to clinch the NFC West with a win over the Titans this weekend. Zuerlein has battled back issues all season. However, this issue flared up the night before last week’s game against the Seahawks. As a result, his kickoffs were much shorter than usual. Zuerlein also missed an extra point for just the second time all season. He will need surgery to repair the herniated disc. Recovery time for the surgery is 12 weeks. Of course, prior to last week’s game, you would never have known that Zuerlein was fighting through a back injury. On the season, Zuerlein has been successful on 38 of 40 field goal attempts. He was also 6 for 7 on field goal tries from 50 yards out or further. He’s been arguably the most impactful kicker in the NFL this season and was rewarded earlier this week by being selected to the Pro Bowl. The Rams were obviously hopeful that Zuerlein could continue to kick through the pain. However, McVay said that Zuerlein could barely stand up straight prior to Sunday’s game against the Seahawks. The 29-year old Zuerlein some how managed to gut it out for that game but he can go no further this season. With Zuerlein out, the Rams have signed Sam Ficken to be their new place kicker. 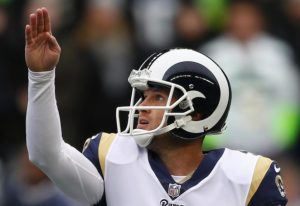 The Rams spent Wednesday auditioning roughly 10 kickers before deciding to sign Ficken. Since going un-drafted in 2015, Ficken has been in camp with both the Jaguars and Chiefs. However, the former Penn State kicker has yet to make his NFL debut. Now he’s tasked with kicking for a team that has Super Bowl aspirations. With Ficken being an unknown commodity in the NFL, the loss of Zuerlein could end up being a season-changing loss for the Rams. The NFC playoffs are likely to include six teams that are all capable of reaching the Super Bowl. A missed kick could end up being the difference between advancing and being eliminated. Prior to last week, Zuerlein was a huge asset for the Rams. Now the Rams are unsure what they’re going to get out of their place kicker moving forward.